Birdwatching is a popular hobby on Long Island. With over 400 species of birds, including shorebirds and winter waterfowl, Long Island is home or haven to majestic ​ospreys, plovers, egrets, double-crested cormorants, a variety of songbirds, hawks, falcons, red cardinals, and more. Here are some of the places where you can observe a variety of these feathered flyers. There are beautiful wetlands filled with birds and marine life near Stony Brook Harbor. Board the 35-passenger pontoon boat Discovery at the harbor for a wonderful ​1 1/2-hour cruise through the soothing surroundings of West Meadow Creek. A naturalist onboard will give a running commentary about the history, geology, and ecology of the area and point out some of the many varieties of birds that live or visit these wetlands. Stroll through stands of oak, red maple, black cherry, hickory, and other stately trees through Uplands Farm Sanctuary's rolling meadows. In addition to lovely greenery and multicolored plants, you'll spy grassland birds including meadowlarks and bobolinks, as well as bluebirds that nest in cozy cavities inside trees in this sprawling sanctuary in Cold Spring Harbor, New York. The Wertheim National Wildlife Refuge lies on Long Island's south shore. Half of the refuge is upland with rare Pine Barren habitats, and the other half comprises aquatic habitats. 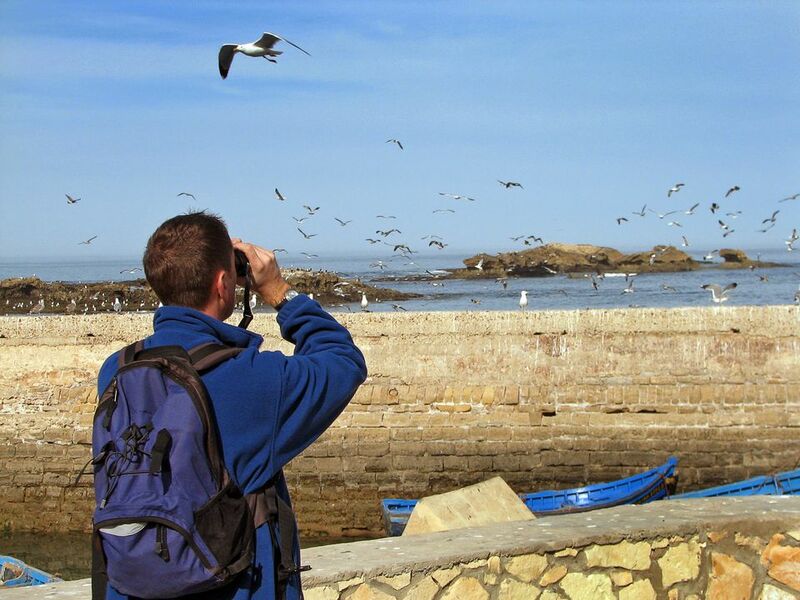 Here you'll find approximately 30 bird species. During the winter, about 5000 waterfowl, mostly black ducks, take refuge here. In addition, the Wertheim National Wildlife Refuge is a migration corridor used by a variety of raptors, songbirds, and shorebirds. The Oyster Bay National Wildlife Refuge covers over 3,000 acres and provides a habitat for 126 bird species. You'll find double-crested cormorants, Forster's and common terns, wading birds, and shorebirds. Ospreys and other raptors like red-tailed hawks, American kestrels, and sharp-shinned hawks fly through the refuge. Waterfowl like greater scaup and black ducks stay here in winter. Waterbirds include the double-crested cormorant and great cormorants. Other waterbirds found here include red-throated loons, horned grebes, belted kingfishers, great blue herons, and more. Shorebirds include black-bellied plovers, least- and spotted sandpipers, and more. Theodore Roosevelt Sanctuary & Audubon Center was the first Audubon Songbird Sanctuary in the U.S. when it was established in 1923. The 12-acre site was originally designated as a protected environment to help songbirds with declining populations due to habitat loss. It is currently a center of activities for children through adults, with environmental education programs, wildlife research, and more. The Garden City Bird Sanctuary is a 9-acre community nature preserve. The main entrance is opposite 181 Tanners Pond Road, Garden City, NY. Over 90 species of birds have been observed at the site, and more species come as the community preserve is re-landscaped and bird-friendly trees, shrubs, and perennials are added. Open daily, year-round, the Elizabeth A. Morton Wildlife Refuge in Sag Harbor, NY features migratory and resident birds including white-breasted nuthatches, blue jays, cardinals, tufted titmice, black-capped chickadees, and more. During spring and fall, migratory warblers and hawks frequent the wildlife refuge. With an entrance just off Main Street (Route 25A) in Cold Spring Harbor, NY, the Cold Spring Harbor State Park is the backdrop for spring and fall migrations of a number of songbirds. In addition, the 40 acres of trails that wind up and down gentle hills also provide a home for great horned owls and red-tailed hawks. Walk the trails for a short or long tour and you'll be treated to some spectacular views of Cold Spring Harbor. This North Shore Park extends all the way to Bethpage State Park and all the way to the South Shore of Long Island. The gardens are open daily and this lovely area is located at 251 Floral Parkway in Floral Park, NY.